Members of the Community Food Growing Network are able to share and exchange on everything from the latest opportunities in urban food growing, tips and resources for growing and meet every three months to spend a day on site at a member project sharing skills and experiences, and building the food sovereignty and community food movement in London. To find out about becoming a member, have a read through the full CFGN Membership Intro Pack. The Community Food Growers Network is free to join, because we believe that being part of a movement for food justice should be accessible to all projects. 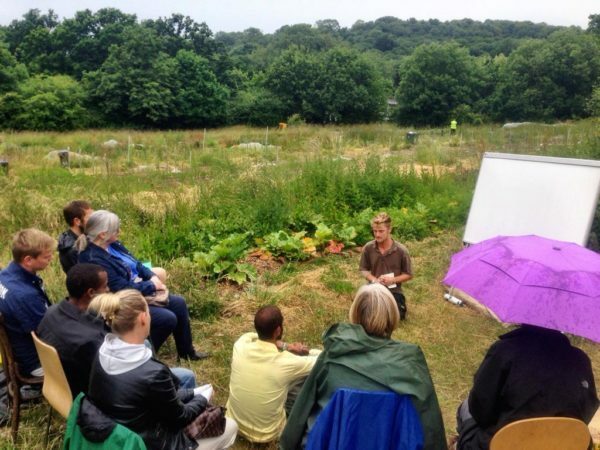 We currently offer full membership to projects and organisations, and a supporter category for individuals who have experience of community food growing. If you are keen on our work, make sure you’re signed up to our e-newsletter (you can sign up on our website) and follow us on social media to stay tuned, and get in touch with info@cfgn.org.uk if you’d like to chat about joining as a member project or a Supporter. As a member of CFGN you get to be part of an exciting network of groups doing amazing things across the city. CFGN usually operates on a combination of a small budget and the energy and ideas of our members, so the more everyone puts in, the more everyone will get out! As a member of CFGN, you get access to the support and training that we produce. We try as much as possible to ensure that support and training is free of charge for members. In the past, this has included workshops, one-on-one consultancy sessions, and subsidies for external trainings. We also bring together information and resources from across our membership (such as price lists, lease documents, template emails for contacting your Council, etc) and make it accessible to CFGN members. Members collaborate on projects and funding applications, and share tips, job opportunities and resources on the email list. We also publicise the events and news of our members through our monthly e-newsletter and social media. We also sometimes produce a newspaper – The Plot. When we have capacity, CFGN responds to consultations of borough-wide Local Plans, as well as city wide policy and strategy documents. All of our submissions are written with the experiences and opinions of our members front and centre, so being part of the Network creates opportunities to feed into wider discussions of policy. Last but not least, you get a chance to shape the landscape of food politics in London. CFGN is made up of passionate and inspiring people who are nurturing social change through growing, cooking and eating food. Together we can achieve so much more than we can on our own. For a fuller understanding of how we work, read the full Membership Intro Pack have a read of these organising principles. Still have queries about the network and membership? Get in touch.